Gruden wasn’t wrong, as his Raiders defense finished the regular season ranked 32nd in total pressures with 120 in 2018, and the 31st-ranked Tampa Bay Buccaneers defense just ahead of them had 231 total pressures. Oakland also ranked 32nd in total pressure percentage (23.3%), sack percentage (2.5%) and third-down pressure percentage (26.1%) – objectively finishing as the worst pass-rushing defense in the NFL. Coming to Gruden’s aid, Senior Analyst Steve Palazzolo gives Gruden two good – if not great – pass-rushers and adds some talent on the back end with the Raiders’ three first-round picks in his latest mock draft. Starting at No. 4 overall, Palazzolo brings former Kentucky phenom Josh Allen to the Silver & Black to fill the gaping hole left along the edge of the team’s defense with Khalil Mack’s departure. 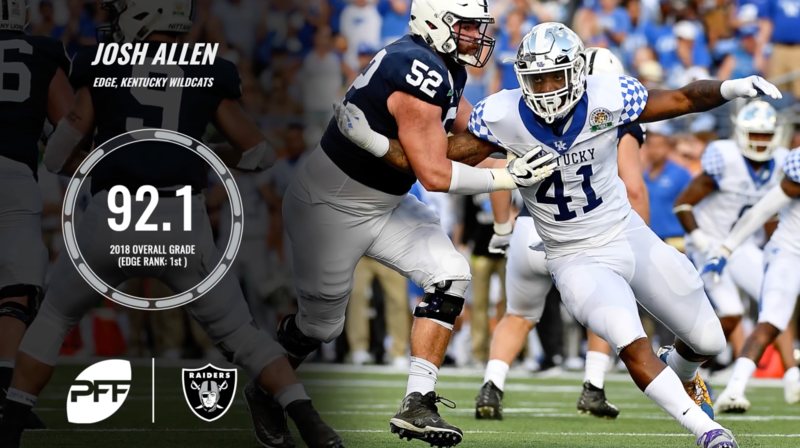 Allen led all FBS edge defenders with at least 400 defensive snaps played in overall grade (92.1) and pass-rush grade (93.8) as a senior with the Wildcats in 2018. The 6-foot-5, 230-pounder also dropped back into coverage 152 times this past season and earned an impressive 83.2 coverage grade in the process. Among the 237 FBS edge defenders with at least 200 pass-rush snaps in 2018, Allen ranked second in pass-rush win percentage (28.3) and first in pressure percentage (23.4). His 2018 pass-rush win percentage also ranks second in the PFF College era (2014-Present), and his 23.4 pressure percentage ranks third. Allen finished the year with 57 total pressures (28 hurries, 12 hits, 17 sacks) in addition to five forced fumbles while rushing the passer. In coverage, Allen recorded a position-high 23 defensive stops and forced five completions across his 152 coverage snaps. He allowed 14 receptions for 148 yards and one touchdown from 20 targets on the year. Palazzolo continues to add pass-rushing talent after selecting Allen with Oakland’s next pick in the first round at No. 24, selecting former Ohio State defensive interior Dre’Mont Jones. Listed at 6-foot-3, 286 pounds, Jones is the next man up in what is becoming a long line of NFL defensive tackles that are smaller than the ones of yesteryear but much more athletic and capable of rushing the passer. 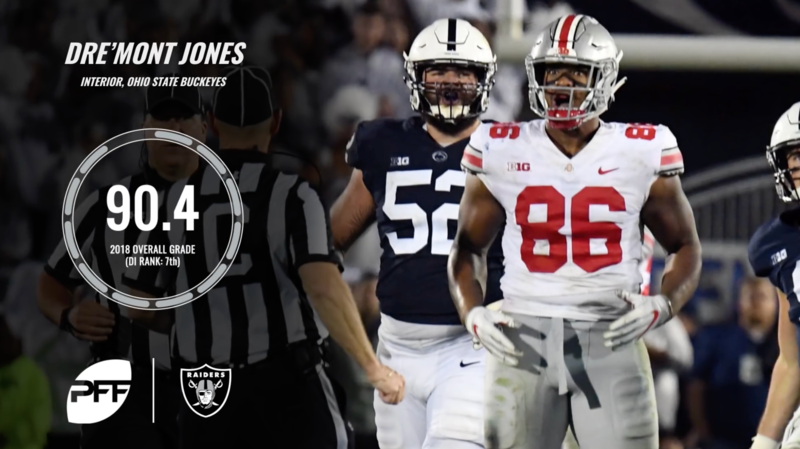 Jones finished the 2018 season ranked fourth in pass-rush grade (90.1) and seventh in overall grade among qualifiers at his position. Jones’ 15.7 pass-rush win percentage across 465 pass-rush snaps also ranked fourth among interior defensive linemen with 200-plus pass-rush snaps. Drafting P.J. Hall and Maurice Hurst a year ago, Oakland’s need at defensive interior isn’t pressing, but, as Palazzolo often says, “draft good players, not positions.” Jones may not play a clear-cut position of need for the Raiders, but he’s a good player – and Gruden & Co. have a clear need for those. Moving away from the trenches, Palazzolo took former Washington safety Taylor Rapp with the Raiders’ final pick of the first round at No. 27 overall. The 21-year-old Washington native ranked third in overall grade (90.1) among FBS safeties with 400-plus defensive snaps. He played 52.5% of his snaps at free safety, 19.1% in the box, 13.1% at slot cornerback and the latter 15.2% split between special teams among other defensive positions. Rapp ranked eighth in forced incompletion percentage (27.8%) and second in passer rating allowed (12.0) among the 191 FBS safeties with 300-plus coverage snaps in 2018. He allowed just eight receptions for 53 yards from 18 targets and logged two interceptions in the process. Allen, Jones and Rapp could all step in as immediate contributors in 2019 to help sew up the litany of issues currently plaguing the Raiders’ defense. This story was brought to you by Eckrich – official sponsors of the College Football Playoff.